Whenever someone asks me what type of music I listen to, I always have to pause. Because, when I answer, I always get a confused look and an odd “okay” from them when I tell them what I enjoy. I listen to movie scores. All the time. I’m not familiar with pop music other than what I hear on the radio while driving with my family. They do not share my passion for movie music, and I’m fine with that. It does make me happy when I hear my 12-year-old hum “The Imperial March” or “The Raiders March,” however. Movie scores are a niche market. You don’t find them much at stores that still carry physical media, and they don’t top the charts like they used to back in the day. Concert Blu-rays are a niche market in terms of Blu-rays. So you can imagine my surprise and joy when it was announced that C-Major Entertainment would be releasing a Blu-ray of a movie score concert and that it focused on none other than the Maestro himself, John Williams. A John Williams Celebration is taken from the Opening Night Concert and Gala of the Los Angeles Philharmonic’s 2014/15 Season. Gustavo Dudamel, who has long been a friend and admirer of Williams, is the conductor of this concert and the musical director of the Phil. The Los Angeles Philharmonic, which performs the music selections, has had a long career with Williams. He has been a conductor for them many times, and many of their musicians often appear on John Williams movie scores. A John Williams Celebration arrives on Blu-ray June 30th, and it is a marvelous testament to the Maestro and his music. Selections from Schindler’s List, Jaws, Amistad, and Star Wars are some of the highlights of the disc and if you love Williams’ music, this is a must-have. The selections from the concert are many of the same ones that can found when Williams performs these himself when he appears at the Hollywood Bowl, or with the Boston Pops for example. While the Blu-ray does not include music from The Adventures of Tintin, as the original performance did, what is included is fantastic. Seeing a John Williams concert live, or getting to see a concert of Williams music is not something that everyone will ever have a chance to experience. This is the next best thing. The 16:9 high-def picture is stunning and the DTS-HD Master Audio 5.1 fills the room as if you were there. The camera lovingly lingers on the orchestra, the conductor, the featured performers such as famed violinist Itzhak Perlman and also on Maestro Williams, who is on hand for this tribute. 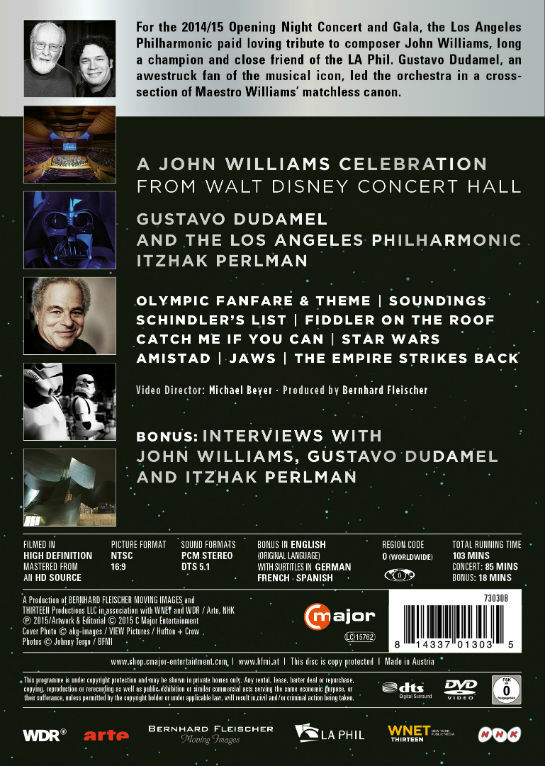 The special features contain an interview with Perlman and a very open discussion between Dudamel and Williams about some of the music presented in this program. In media, there are some special features on Blu-ray and DVD that discuss Williams’ music and contributions to film scores. However, it’s rare to find such an awesome tribute to the man who has given so much to film music and Star Wars fans the world over. Support this release at any cost… especially to see a certain “guest” conductor come out to conduct “The Imperial March” flanked by some of the Empire’s finest. Absolutely wonderful. **This title is also available on DVD, although only the Blu-ray was viewed for this review.